A: We allow our customers to reschedule or cancel their reservations. However, deposit refunds will not be given. Q: What if I forgot to add my coupon code to my order? A: Unfortunately, once an order has been placed we cannot add any discount, promo or coupon codes. A: Yes, although additional fees may apply for areas farther out. Prices include set up and delivery within 20 miles of our warehouse. Q: What does the Damage Waiver cover? A: The Damage Waiver covers any accidental damage to the equipment. Improper use of equipment voids Damage Waiver. A: No. The jump should be clean when you get it. 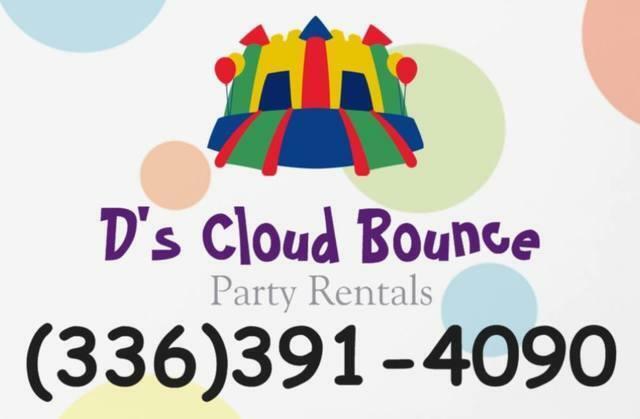 D's Cloud Bounce cleans and disinfects after every rental. A: Yes. A blower keeps air in the jump unit the entire time. Once unplugged they deflate. That's why we require an outlet within 100' of the unit or a generator. Longer cords can pop your circuit breaker so we bring our own heavy duty cords. A: We love setting up at parks but most parks do NOT have electricity. If you want to set up at a park it is your responsibility to verify that power is ready and available upon delivery. We rent generators at a reasonable cost, should there be a need for one. A: Yes all orders require a 10% Credit Card deposit. Deposits are non-refundable.